Hope everyone had a terrific Tuesday. I'm not a huge Christmas shopper but for some reason I found myself with an actual list today. Aint nobody got time for that! Tonight I have another one of those lovely Pure Ice polishes from their Velour Collection. 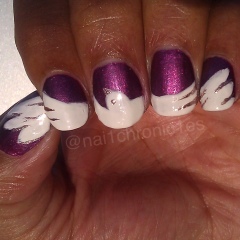 You saw a glimpse of Touch Me Softly a little while ago when I did some tribute nails for a friend who lost her mother. More pics after the jump. Touch ME Softly is a warm purple/berry colored polish. 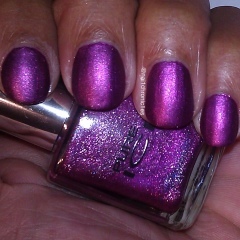 As with all the other polishes in the Velour Collection, Touch Me Softly went on velvety smooth and opaque in 2 coats. Take a look. Here's my first connecting design ever! The design wasn't hard, getting my fingers to connect was like fitting a circle in a square hole. My only gripe with these polishes is that I can't wear a top coat as to keep the "velour" finish intact, so I see tip wear pretty quickly. Nevertheless they are all beautiful thus far. I have a few more from this collection to show you all in the coming days. 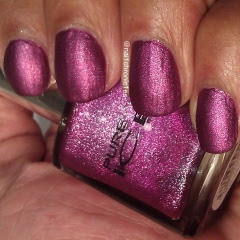 Pure Ice polishes retail for 1.97 and sold at Walmart's nationwide. Have you picked up any of the Runway Trend polishes?